Myforexidea is my pet project. I wanted to share here how it has been built. The idea behind myforexidea is to create a tool to help user to create robots using mathematical formula in conditions. The complexity here for a person wanting to create a robot is to write the conditions and the structure. Currently myforexidea creates robots for metatrader 4, a well known platform for trading Forex. It means that the code generated by myforexidea should be written in mql4 : the language of the platform. Conversion of the AST into mql4. Composition of the final mql4 code given strategy parameters. The application has been designed to enable compilation into other programming language. That's on purpose since the future of myforexidea is to go further than MT4. For parsing the formulas I used a ANTLR4 grammar that I have created for formulas. To compose the final mql4 code I use freemarker. It is a good template engine. I just needed to take care about automatic parsing of number but was easily fixable. Running the code on the platform and doing manual test are also sometimes impossible. Hence it is hard to find data for certain very specific case. Creating a perfect compiler from a language like MQL4 to Java takes time. It's a pet project : I had no time. So it will not be perfect ! Who cares ? At the end it was a winning strategy even if i wonder if I shouldn't have created a JAVA (or other testable language) to MQL4 compiler. It would have ease compilation into other platform than MT4 but it would have been possibly more time consuming. I had the chance to work with react and redux in the past. Redux was good for state management and I took some ideas of it. Nonetheless I've chosen to keep my strategy object mutable. The benefits of immutability in the context of something that can be only changed by user interaction is not trivial in this case and it has a huge cost (Doing normalization in particular can be overwhelming). Back to the time I started, I didn't know about mobx but I will probably use that if I refactor the application later on. I end up using peg.js it is fast, feature complete but badly documented. The killing feature is its online live testing tool that I used a lot to create the grammar. Thanks guys you did a very good job overall. I have for a long time searched for the perfect library to create a graph with the different step of the strategy. For me it makes the tool way more usable and easy. If I pretend making the life more easier for non developer, I cannot propose a tool too complex as a solution. Let face it, there is no one library that permits to do what I wanted. Finding that out took me almost the same amount of time that's doing all this with a low level svg library (snapsvg). Did this search worth it ? Of course, doing a library by yourself takes normally huge amount of time and on top of that you have to maintain it. If someone would have do that for me obviously I wouldn't have reinventing the wheel. I also use Bootstrap 4 since I only use css it is stable enough even in alpha. Recently I have discovered primeng. There is lot of components converted from primefaces to angular2. I wasn't convinced by angular material components but here there is a lot of really good ones. I will probably migrate some of my component to it. I use json web tocken to manage authentification. JWT offer me the possibility to have a stateless architecture by removing the need of session management. Also it is very versatile as I will show you. When user land on myforexidea it automaticaly creates a temporary json web token that is stored on browser's localsession. This web token as an audience "temp" that will disable some features. Nonetheless myforexidea stays usable to a certain extend for the not logged user and idea are stored on the backend server as for normal user. If the user loses it's JWT, its ideas will stay phantom ideas : nobody will be able to see them anymore. When the user connect, the backend server moves the temp user ideas to the users ideas. To manage easily this user I have an AuthHttp object that replace angular2 Http where needed. 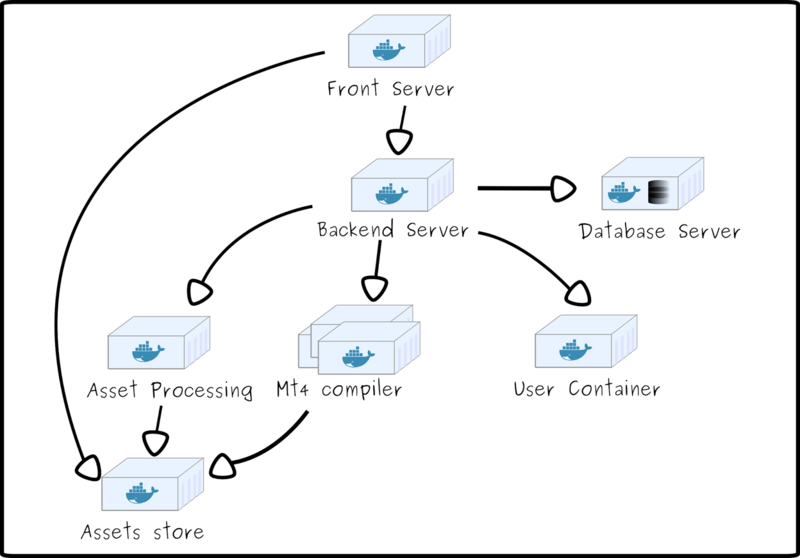 That's still a work in process but I describe here the target architecture which follow the idea of microservices and stateless server. All the application is bundled as docker containers. 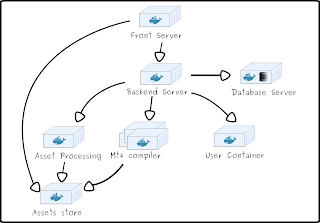 The front server : It's a apache2 container that is the entry point for the user. The asset processing container : It is responsible of converting user assets (image) but possibly other stuff. The Database : a simple postgresql instance. It is a bit complex as an infrastructure but it is really easy to deploy containers nowadays and brings so much flexibility that it worth to be done.